And that cat is...amazing? adorable? fantastic? xD How did that happen? That is totally AWESOME!!! I want a cat like that! YAY!!!! I;ve missed ya!!!! hmmmm! I like those cats! Oh...WOW!!!! I want one!! I missed you so much!!! How did the cat get wings tho? That's amazing! How was your trip? Obviously, we are all very glad your back! Check this out: http://www.youtube.com/watch?v=Xh4UIrg-7wI&feature=related it's completely insane and somewhat disturbing, but it's funny. Did you have a good time? 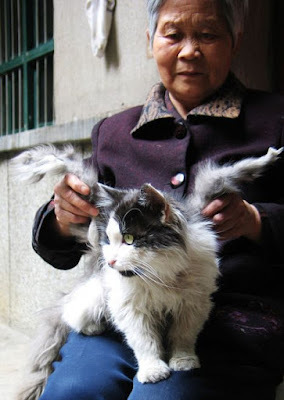 I would LOVE a winged cat. Actually, I'd love a cat, period. that is made of win! do a post about your trip, where did you go? how was it? Hope you had fun and that you enjoyed your break... does this mean that your next book is about to come out??? wow, this just brought back a memory from grade 3, we read a book called "CatWings", by Ursula K. Le Guin for novel study. it was about four tabby cats that were born with of course, wings. this cat should totally be Spidermans new arch nemesis in the up coming movie!!! That's so awesome. Maybe his descendents will have wings and become a species of catbirds. Except they already have those. Birdcats? Don't be too speechless Kirsten-san, the wings are just mats of fur-- no flesh or bones inside. And they'll fall off when the kitties shed. Cool-looking, but not miraculous. On one of the "after humanity disappears" shows that were on a few months back, they imagined the skyscrapers losing their windows and outsides, and dirt would blow in and trees grow and small animals move in and then the cats that hunted them might evolve flaps of skin for gliding between buildings. we hope u had fun!!! that cat is so cool! Well WELCOME BACK! That is one cool cat. makes me want to pet the cat and go "mwaa haa haa haa"! I don't claim to be an expert (or even know anything about it), but the photo looks fake to me, personally. And, by the way, what ever happened to International Mastermind? Oh my word, that is CRAZY. I've read CatWings too! This reminded me of it. That is so.... unusual. I would feel so scared to be hugging my cat one day and find two flappy parts. If the cat were a pure white persian, then it would look like a cat angel. Mine is persian chinchilla, it's white and gray.